The exhibition aims to challenge the conventional definition of drawing as a work on paper by exploring the radical transformation of the medium throughout the last century, a period when numerous artists critically examined the traditional concepts of drawing and expanded its definition in relation to gesture and form. The exhibition brings together approximately 300 works, many drawn from MoMA’s collection, by over 100 artists from over 20 nations. Crossing disciplinary boundaries, these works relate drawing to selections of painting, sculpture, photography, film and dance (represented by films and documentation, as well as live performances). The exhibition was organised by Catherine de Zegher and Connie Butler, The Robert Lehman Foundation Chief Curator of Drawings at MOMA. And the former name should be becoming familiar in Australia – as de Zegher is co-Directing the 2012 Biennale of Sydney. So perhaps Emily's selection didn't come quite out of the curatorial blue. 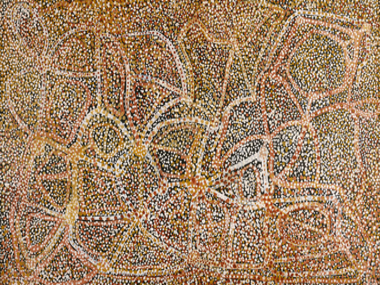 Sadly, it doesn't look as though anyone of Ryan's calibre was invited to join in on MOMAs extensive program of talks and performances that might have illuminated Kngwarreye's presence in this important show.